The best time to start working on Christmas ornaments are before the hectic Christmas season is upon you. In early fall you can make tons of ornaments and when Christmas rolls around you will be all set. Besides you will need a little time to gather up those wine corks! 1. Measure and mark ¼” from the end of a wine cork. (The thicker end that didn’t go into the wine bottle. The end which was inserted into the wine bottle is a tad thinner than the outside end.) Use the awl with a twisting motion to drill all the way through the cork. Take it out and drill it the opposite way to make sure there is a path through the cork. Repeat for the other 6 corks. 2. Squeeze some tacky glue onto a paper plate and on another plate pour some glitter. Use the paintbrush to apply some glue onto each end of the wine corks and dip into the glitter. Use a third paper plate to place the wine corks with the glittered ends to dry and let dry completely. 3. Using the wire cutters cut an 18-inch length of 14 gauge silver wire. 4. 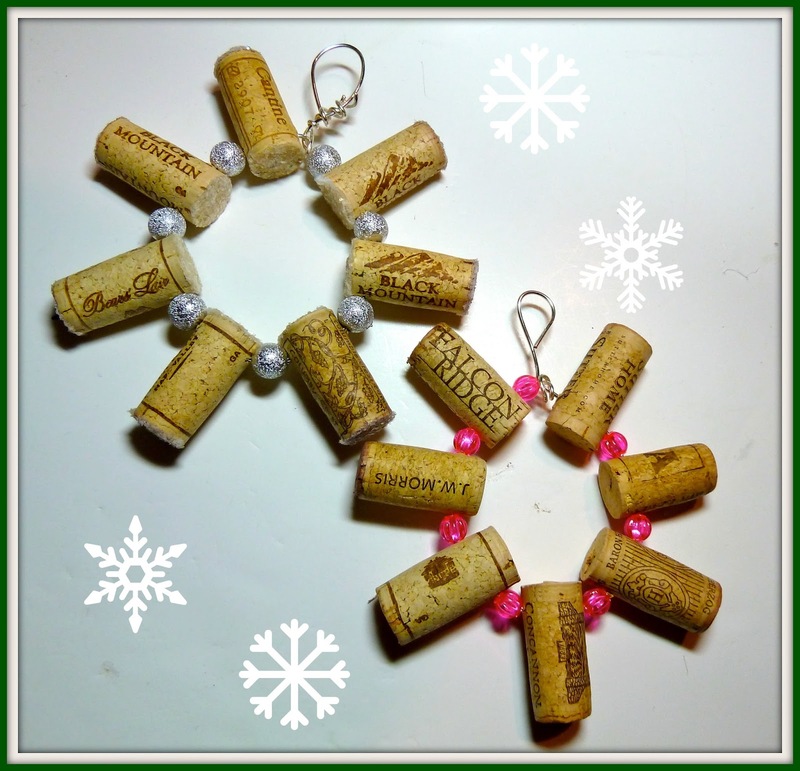 Thread the wire through each wine cork with a bead in between until you have added all the wine corks and beads. 5. Use the needle nosed pliers to join the two wire ends in a circle and twist around to join. Make a loop with the excess and twist around in a pleasing shape as before. 6. Adjust the wire into a circular shape. The corks will form a sunburst star. Very cute! We saved wine corks for years, intending to find something to make with them and we just threw them away. Maybe I'll start saving them again for next Christmas. This is an excellent idea! My brother and sister-in-law collect wine corks! I'm back from having computer problems! Yepeeee ;o) LOL! Such a fun idea......I always hate throwing the corks away but now the kids will have fun with them. Thank you for sharing with the Clever Chicks Blog Hop! I hope you’ll join us again next week! Adorable! I have a book club and we exchange little crafty gifts each season. I have a bunch of corks from a year's worth of book club meetings...no I know exactly what to do with them! ;) Thanks!